All dumpsters have the same width, 7.5ft. – 8ft. They vary in length and height depending on the size. However, since the dumpster slides off the back of the truck, we require the length of the dumpster (11′ to 21′), plus the length of the truck (35′). That distance can include the street. We do have mini trucks that are 16 feet long for dropping 10 yard dumpsters. 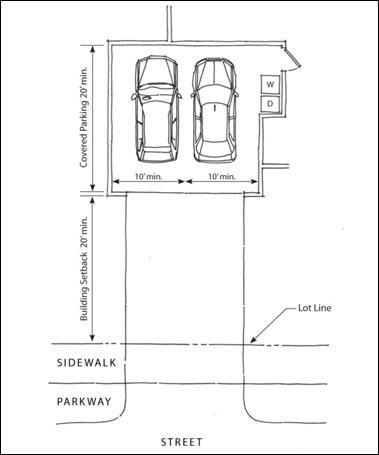 It is also important to know that while the dumpster is approximately 8′ wide, the truck is between 9-10′ wide. 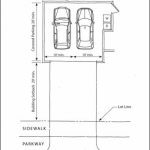 Over-head wires, canopies, and low roof overhangs are also considerations when determining what size dumpster your driveway can accommodate. While the actual dumpster is only 6 feet tall on the ground, a 30 yard dumpster is about 25-30 feet tall when it is being dropped off. Both 20 yard and 10 yard dumpsters are 23-27 feet high when being serviced. Under some conditions, we can place the dumpster on the driveway and then slide it under the obstacle in question. It matters if there is enough length. Also, considering that the dumpster will be much heavier after it is filled and therefore harder to move. If all else fails, a permit can be obtained to put a dumpster on most streets in front of a New Jersey driveway. What size dumpsters do you have? 10 Yards – (11’L x 7.5’W x 3.5’H) Great for a bathroom renovation or 2, or a very small cleanup / de-clutter project. 15 Yards – (16’L x 7.5’W x 4.5’H) Ideal for a small-to-medium kitchen remodel, a small move, or slightly larger cleanup / de-clutter project. 20 Yards – (21’L x 7.5’W x 3.5’H) The go-to for a medium renovation project, roofing, a larger move (without too much furniture), or larger cleanup / de-clutter project. 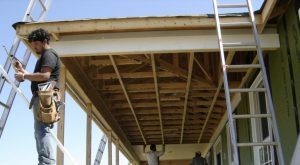 30 Yards – (21’L x 7.5’W x 6’H) The choice for a larger remodel, a move (with bulky items), or larger cleanup / de-clutter project. This is a good choice for a move if you have lived in the house being cleaned for (10) years or more. When selecting a dumpster size, we recommend that you ‘size up’. We say this because there is a trucking charge built into each dumpster cost, regardless of the size. Consequently, you want to minimize the number of dumpsters that you get by sizing up, thus minimizing the number of trucking charges. For example, a 20yd dumpster holds the same amount of trash as (2) 10yd dumpsters. However, you will save almost 40% by opting for the 20yd, rather thank renting the 10yd and having trash left over… making it necessary to rent a second 10yd dumpster. There is often only a $100 to $125 difference to step up to the next size. When determining what size dumpster you need, we also recommend that you put the debris in as few piles as practical. Next, compare the size of the pile(s) to the dimensions of each dumpster. Trash often looks like less when it s spread throughout a house or area. Call us, we can help. 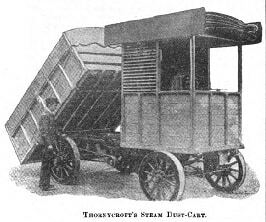 One of the earliest, if not the earliest, dumping trucks was the Thornycroft Steam Dust Cart (pictured below) developed in 1896 and first used by Chiswick District Council in London, England. The Thornycroft Company made steam trucks, but this tipper version was an adaption for dust cart purposes. The front cab included the boiler which provided 180 PSI pressure. Moving the machine was the twin cylinder compound engine (3″ + 6″ by 3″ stroke) which was mounted down low. The final drive chain is visible in the photo. Although Messrs Thornycroft was responsible for the design and engineering, the bodywork (and maybe the chassis too) was made for them by the Bristol Wagon and Carriage Company. The dumpster itself would have to wait nearly forty years to be invented. The word “dumpster”, first used commercially in 1936, came from the Dempster-Dumpster system of mechanically loading the contents of standardized containers onto garbage trucks. The patent was shared by the Dempster Brothers in 1935. The containers were called Dumpsters, a blending of the company’s name with the word, ‘dump’. The Dempster Brothers first patented the dumpster in the 1935 in Knoxville, Tennessee. The original dumpster was designed to be used by mechanical arms, but that process wasn’t perfected until the 1950’s. In essence, the Dempster brothers patented the first ever garbage truck called the Dempster Dumpmaster. George Roby Dempster used his fame to reach political office in Tennessee. He was the Mayor of Knoxville. 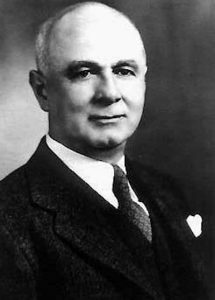 Along with his brother, he started the Dempster Brothers Construction Company in the 1920’s. After his retirement, George Dempster became the City Manager, a political position working on the alliance between government and business in building and construction. Consequently, he become a very famous American mayor. Dempster units are still manufactured today, but only have a small percentage of the market. Currently, models are called “Roll-off” units, but the term Dumpster has stuck.